Cheetah brings 20 years of experience in carrier class, systems-based, broadband quality assurance worldwide. Cheetah’s "Quality of Experience" and "Quality of Service" monitoring solutions enable the highest performance in cable television networks and the highest quality in video delivery systems. Cheetah alone combines the knowledge, technology, systems, software, products and professional servicesthat enable source to subscriber operations, alarming, monitoring and provisioning in today’s complex broadband networks. Service providers in more than 20 countries rely on Cheetah for the largest and most agile installed base of monitoring and management resources. Cheetah sells products and services globally, and enjoys partnerships with many of the major broadband technology corporations throughout the World. The IDH4 series of transponders is the premium, fourth-generation DOCSIS® status monitoring product family for Alpha broadband power supplies. The IDH4 mounts internal to the power supply unit. It provides comprehensive monitoring, control and management for individual power supplies, power supply systems containing multiple power supplies, multiple battery strings and AlphaGen generator systems. It is designed for all XM2 and XM3 series power supplies, and no separate interface is required. The IDH4 is a joint venture between Alpha Technologies and Cheetah Technologies. 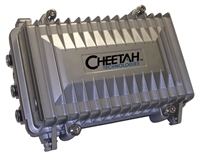 The Cheetah Network Tracker Plus is a revolutionary device that allows a CATV operator to install them at any mission critical or end of line location in a HFC broadband network. The Network Tracker Plus can be creatively used to improve network quality & reliability, to enable a quality assurance program, and to achieve workforce automation. Network Tracker Plus allows the CATV operator to complete on-demand or scheduled system analysis at any location from the office to the consumer. Network Tracker Plus units can be installed at end of line locations to automate the semi-annual FCC proof of performance test process. Network Tracker Plus can be used as a 24-hour monitor for difficult customer network or content troubleshooting issues. CATV operators can use Network Tracker Plus as a workforce quality assurance tool installed beyond a work area to eliminate inadvertent workforce caused outages. Network Tracker Plus installed at key system health points, such as longest coaxial feeder cable, longest optical link, fiber service areas, and other locations can provide long-term system analysis and scorecards. Using Network Tracker Plus PoE (Power over Ethernet) ports for a wide range of institutional network purposes. Close circuit television networks, wireless access points, emergency call boxes are just some of the devices that can be integrated from to the PoE ports. Cheetah Technologies’ CheetahLynx Controller is a one rack unit, small form factor IP based network element that enables clients to remotely view and alarm on RF level and DOCSIS® channel measurements using Cheetah’s Network Tracker device. The controller can be setup for manual or automatic discovery of all Network Tracker devices deployed throughout the network (up to 200 devices per controller). As the number of Network Tracker deployments grows, additional controllers can be added to meet system expansion requirements.